Source: Federal Aviation Administration, 2016 Passenger Boardings at Commercial Service Aiports. All peer regions are classified as primary airports. * To calculate the U.S. average, enplanements in the 382 primary airports were averaged. Airports with a large number of passenger boardings typically have more terminals and offer more non-stop flights to domestic and international destinations. This allows tourists and workers alike to get to their destination in less time. Having an amenity of a large airport with non-stop flights is an attractive element when employers are looking to locate to an area. 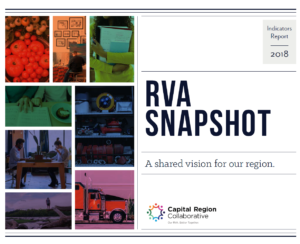 In the Richmond Region, this statistic increased from 1,671,096 to 1,777,648 since 2014.